Contact! is an enthralling set of recollections from ex-RAF pilot, instructor and test pilot Bob Tuxford. The book follows his twenty-year career within the RAF and describes highlights of active service across the world, including an accompanied exchange tour in the US Air Force and participation in the Falklands war. 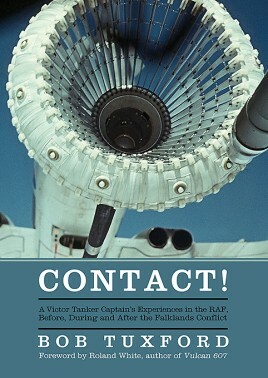 The title, a nod to the crucial response during air-to-air refuelling, underlines the important role that Bob carried out during his career as a captain of Victor K1s 214 Squadron in the 1970s, and K2s on 57 and 55 Squadrons in the early 1980s. This experience led to him playing a vital role in the first Black Buck mission during the Falklands campaign - by being the last Victor tanker to refuel the Vulcan piloted by Martin Withers before bombing commenced on that fateful night in 1982. For this, he was awarded the Air Force Cross for gallantry. In the latter years of his career, Bob made the transition to test piloting and became the senior test pilot on the heavy aircraft test squadron at the Aircraft and Armament Experimental Establishment, Boscombe Down. This book is not just for aviation enthusiasts, but for those wanting a greater insight into the importance of the work carried out by tanker squadrons within the RAF during the Cold War. Squadron Leader Robert Tuxford, AFC RAF Retd, graduated from the RAF College Cranwell in 1970. His first operational tour was on 214 Squadron on the Victor K1 3-point tanker in the air-to-air refueling role. Selected for a coveted American exchange posting, Bob then flew the Boeing KC-135A Stratotanker within Strategic Air Command at Mather AFB, California as an aircraft commander and instructor. On promotion to squadron leader, he returned to the UK to Central Flying School to undertake training as a qualified flying instructor. After a brief instructional tour in Yorkshire flying the familiar Jet Provost, he was posted back to the Tanker Force at RAF Marham as an executive on 57 and then as flight commander on 55 Squadron. Flying the Victor K2 in support of the South Atlantic operations during the Falklands war, he participated in the iconic first Black Buck mission. After qualifying as a test pilot at the prestigious Empire Test Pilots’ School in 1983 at the A&AEE Boscombe Down, Bob undertook flight trials on a wide range of aircraft including all the RAF’s tankers: the Victor, VC10 and newly-acquired TriStar. On leaving the RAF in 1987, he flew as a commercial pilot for Monarch Airlines, retiring in 2010 with close on 19,000 hours and seventy types in his logbook.